I bet Camille Grammer’s ugly bug-eyed head spun around when she heard this news. 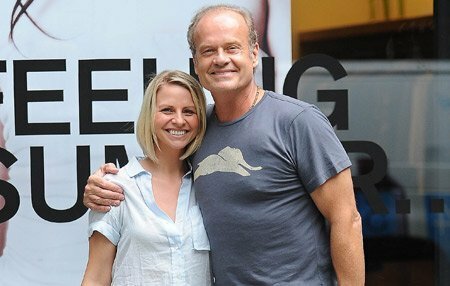 Kelsey Grammer, 55, and his girlfriend of not even a year Kayte Walsh, 29, are engaged to be married. You hear that Camille? Kelsey and the woman he left you for are very happy and totally in love. I bet you want to make weird faces and roll your eyes, then play the victim card. And your divorce isn’t even final yet! Zing! That’s gotta hurt. Earlier this year, the award-winning actor and his British flight attendant girlfriend (now fiancé) announced that they were expecting a child together. Sadly (depending on who you ask), Kayte Walsh miscarried this past October. I have no doubt she will be pregnant again soon, as Kelsey Grammer seems to breed with each of his wives. With a current total of four children, Grammer is father to three girls and one boy. previous post: Elizabeth Edwards’ Cancer Has Spread. Treatment Ceased. hahahaaa what goes around comes around ..
53 queries in 1.328 seconds.